The exhibition features works by 5 artist – Eudora Rusli, Hsiung Lu-Fang, Jacqui Rae, Tan Seow Wei, and Yam Hoe-Chee – exploring the use of objects, coloured squares, knitting and thread to narrate fragments of personal lives. Obsessed with the concept of information, facts learnt about someone or something, they chose to present these with a subjective slant, embracing chaos with aesthetics. In this information age, we are constantly bombarded by facts, and their interpretation in the form of images, figures and text. Marshall McLuhan, coined the phrase, ‘the medium is the message’ to explain ” (prints, television, radio) media affects the society in which it plays a role not only by the content delivered over the medium, but also by the characteristics of the medium itself”. Here, the medium is art and it is more important than the content they carry. The title inFORMATION reminded me of the work the Way Things Go by Peter Fischli and David Weiss. In Way Things Go, objects are placed to perform a acrobatic domino function, triggering mechanical actions by knocking, swinging, rolling and falling over one another. Here, the domino effect could be read subtly between the works. The exhibition title acknowledges how facts are constantly gathered and interpreted, just as how art evolves and art ideas re-made. Art ideas can cause an action-reaction; they knock, swing, roll and fall over each other. It is with this rolling and falling over each other, I see a pattern of connection between the works. The artists presented their interpretation of snippets of facts gathered from the everyday and personal lives. 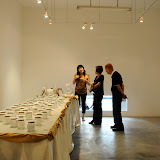 In Tan Seow Wei’s Weight Matters (2011), two sets of objects are framed. On the left, 8 tin buckets with sticks, and on the right, drawings of what appears to be representations of family live, work, ambition, money, health and exercise. The viewer is challenged to shift ‘sticks’ tilting the buckets of balance between ‘intellect’, ‘wealth’ ‘family’ and so on. Curious pulley system suggest that our needs and desires in life are intricately and inextricably linked: shifting one will tilt the other. I remembered a quote by famed philanthropist Tan Kah Kee who said in a documentary, “a needle is not sharp on both ends”. This cryptic saying describes how he may have neglected his family when he was successful in business and charity work. We may not have great social aspirations as Tan Kah Kee. For some of us, perhaps the ultimate dream is balancing work and life. For Eudora Rusli’s The Dream Catcher (2011), bottles of aspirations are captured and arranged in a scale of 1 to 9, with 1 being the nearest to your dreams and 9 the furthest. One can imagine the work to be interactive, bottling new ‘unwanted’ dreams. Unwanted because dreams are not meant to be kept; they should be alive and bouncing. In a ‘feast’ for the eyes, the viewer is left wondering the contents of the bottles. How are the aspirations captured or contained? Do they contain the breath of the person? Alike Donna Ong’s Crysalis (2006), or similar work, the history of the objects take on as much significance as the intended message. Jacqui Rae’s Of the Weft and the Warp (2011) resembles Khiew Huey Chian’s work gone wrong, tangled in a chaotic mess. Thinking deeper, it is a realistic representation of a convolution of information on the world wide web, or info-tangle-web. The word ‘weft’, meaning textiles is used loosely here. As we imagine the thread weaving an impossible fabric, the work takes on a different metaphorical meaning: a world where chaos is default; information comes incomplete or tangled. Thin thread may not be the best material in this quantity, as it loses itself in the vast space and unforgiving lighting of the gallery. Hsiung Lu Fang’s 27th October 2010, and A Day in the Lives of 15 (2011) are romantic gestures to record a fleeting image of a day gone by. The woven scarf almost seems like a stark opposite to Of the Weft and the Warp (2011). Between the Hsiung’s works, one is organic and free form while the other is more regular and rigid. While the explanation of the colour symbolism to the activity they represent is lacking, A Day in the Lives of 15 (2011) clear shows difference in lifestyles, as different yet similar activities fill the day. Like Michael Lee’s recent obsession with inforgraphics, representing the maximum amount of information in the most telling graphical way, this work has the potential to illustrate art concepts in the most succinct, visually minimalistic way. Hoe-Chee Yam’s Dream, Play, Love (2011) reminds me of Bridget Riley’s paintings with fields of flat colour. Alike A Day in the Lives of 15 (2011), they seem to decode and encode the 16 shades and tones of colour associated by 50 respondents to ‘dream’, ‘play’ and ‘love’. They represent a happy, harmonious mood. Paintings like that take time to grow on the viewer, which this gallery setting may not allow in passing. Having seats may help. The artists have succeeded to remake and repack their reactions to their inner thoughts on the everyday. As a set, the works do complement each other in a surreptitious manner, without being too obvious. 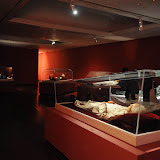 However, the exhibition has a raw ‘degree show’ look. The scale, finish, craftsmanship, lighting and placement of the works were less finished than desired. But in another slant of light, it still fits the title, as things are still in formation. exhibition catalogue on sale for $15. Not exactly Peggy Guggenheim, Rockerfeller or Charles Saatchi or Herb & Dorothy, but people do collect contemporary art in Asia. The spread of artworks on display is not exactly staggering, but still an eye opener to brilliant artists and unique taste of collectors.